Cookbooks should be living documents. They should have things scribbled in them. Aunty Molly’s Ginger Biscuit recipe, quick and easy buffalo wings, the world’s best sticky toffee pudding recipe (all 3 of those are inside the back cover of one of mine). Whoever makes a cookbook should make it with plenty of white space around the recipes and a load of blank/lined pages at the back. They should also be covered with oil stains where the pan’s spat, have the odd bit of dried herb as a bookmark. Like your kids’ favourite books, they should be used. For all the cooking I do, I don’t have that many actual cookbooks. The best ones I’ve got have recipes scribbled in the blank spaces, folded pieces of paper inside the dust jackets and lots and lots of stains from repeated use in the kitchen. 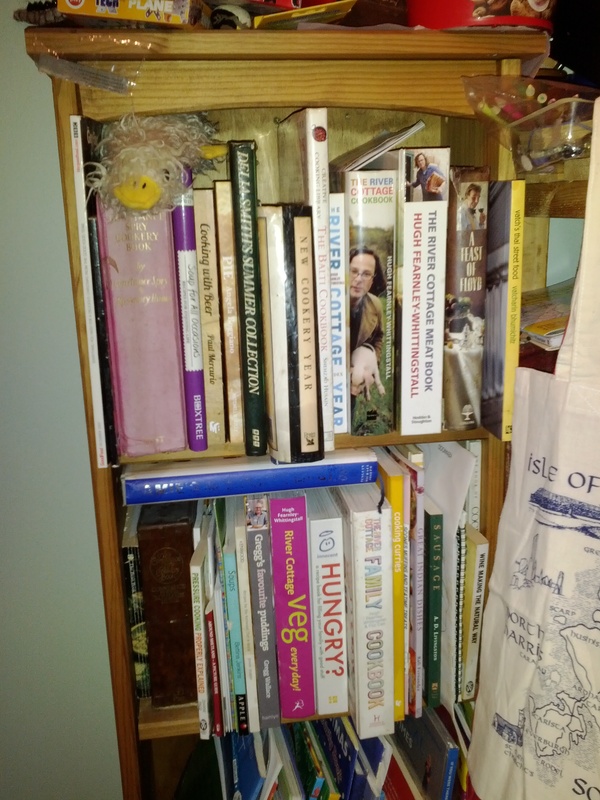 Technically, my wife owns most of the cookbooks in the house, I’m only just catching up! For me, Keith Floyd defined TV cooking for many, many years. Everything about the show – the theme music, the style of his delivery – was his cameraman really called Clive? – the recipes themselves – was compelling viewing. Cooking everything using just one hand (with a glass of wine in the other), setting the hotel room on fire… Brilliant stuff. This is the oldest cookbook I’ve got and contains the syllabub recipe I made for my wife (then my girlfriend) the first time I cooked for her. Over the years I’ve dipped in and out of this book, a jambalaya here, rabbit with ale and mustard there. I’m nowhere close to cooking everything in it and I doubt I ever will be. Floyd also contains more hand-written additions than any of the other books and holds my sacred curry recipes inside the dust jacket. 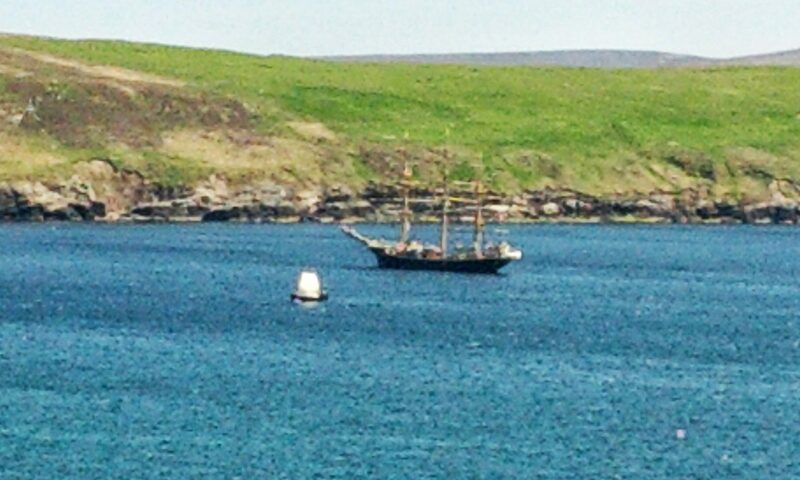 That and a Bank of Northmavine £20. I waxed lyrical about this one in last week’s Recipe Shed post. It’s my current favourite cookbook and there’s not a recipe in it I don’t want to cook. As m’colleage, Keith, mentioned when he covered this on over on his blog, this is part cookbook, part manual for what to do with meat in general. Hugh has a very easy style of delivery, if you’ve ever seen him on TV you can imagine him reading the book to you as you go with it. Not only does it have the single best slow-roasted pork recipe I’ve ever tasted, it also contains my go-to recipe for jerk chicken. 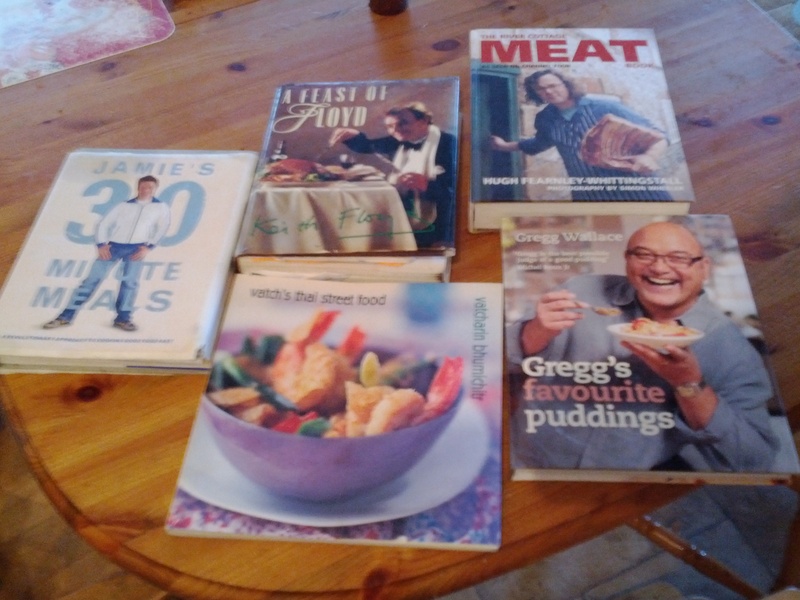 If ever a man knew puddings, it’d be Gregg Wallace. He’s on Twitter as @puddingface. He can be seen drooling over the wonderful concoctions from the Masterchef chefs. He’s parodied mercilessly in the “Historical Masterchef” sketches on Horrible Histories (him and John are both done very, very well there). And his book of puddings doesn’t disappoint. Unfortunately I don’t get to do much with this book for the first few months of the year as they’re not exactly conducive to dieting. If I had to pick a couple of favourites, they’d be the treacle tart and his divine rice pudding. Jamie Oliver, 30 Minute Meals. Jamie Olive Oil, as he’s referred to in certain circles (go on, try finding a recipe in the book that doesn’t use “a lug of olive oil” somewhere – it’s like Delia Smith’s Summer Collection and limes, Delia Smith being an anagram of it had limes), has written a blinder of a cookbook here. Since my wife was given this book as a Secret Santa present for Christmas 2010 we’ve cooked 1 recipe a week (give or take) for the last year and we’re 2 recipes short of cooking the lot. We’ve scored each one out of 5, scribbled down a review and noted any substitutions or alterations we’ve made. There’s been only 1 recipe we’ve not really enjoyed as a family but far more we’ve come back to time and again. I’m going to write more about this book in a couple of weeks, when we’ve finished it. Put very simply, though, if you’ve not got a copy of this book then you need to buy one. It’s on offer in most supermarkets, anyway. A book called Meat, may just have to add that to my collection, can’t have too much meat. You’ve inspired me to pick up the Hugh book. I love his River Cottage programmes, and I love what he did for battery chickens. That’s a nice broad selection of books you have there. Surprised your curry book isn’t here! I would have said you used that more than Hughs. Besides haven’t we realised I do “Western” cooking and you do “Eastern”?? Do you know, I’d forgotten about that one when I was writing this list! I’d swap it out for Meat, definitely. Will have to give it a page all of it’s own. A good broad selection here. Off to read about the Thai cookbook as I love Thai food. It’s a very. very good one. Don’t try and buy a new copy on Amazon, they’re astonishingly expensive (or they were last time I looked). Previous PostPrevious Maverick – Closure at last.